Nonprofit Mercy Corps is known for its overseas work bringing relief aid to disaster zones. It has also long been a champion of microfinancing and business education, both home and abroad. In November 2017 Mercy Corps opened its first Community Investment Trust, which is like a REIT for low-income people. 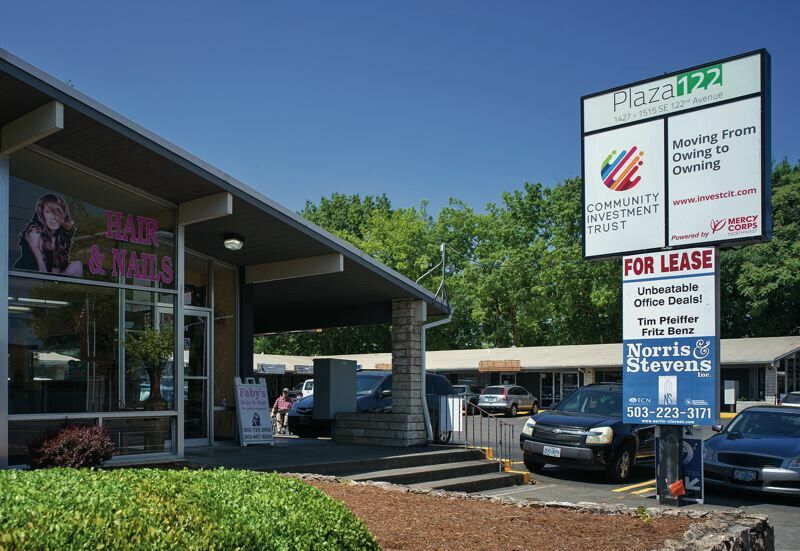 Instead of an apartment building, the usual asset by which investors earn a steady income, Mercy Corp chose a run-down shopping plaza on Southeast 122nd Avenue. The immediate goal was to allow low-income people to make small monthly investments in the plaza, buying shares which generate an annual dividend. The deeper goal to bring more people into the investment class, as well as promoting local pride and a sense of ownership. Two-and-a-half years after buying the property with other "impact" investors, as he calls them, John Haines, executive director of Community Investment Trusts for Mercy Corps took the Tribune on a tour of the property. This pilot program is now in its 10th month, and the trust had just declared a 9.6 percent dividend for end-of 2017 investors. If someone had invested $100 in the trust in the two months it was open in 2017, they would be getting an extra $9.60 added to their account. Haines told the Business Tribune that finding Plaza 122, which is at 1433-1515 S.E. 122nd Ave., came from listening to the locals, many of whom live in low-income housing. Before being allowed to invest, however, they have to take a Mercy Corps class called Owing to Owning. "It's what people had asked for. They want to learn budgeting, goal planning, and a risk return of a range of investments, and then we present this as an investment option at the end." Investors must be at least 18 years old, have a tax ID number and live in one of four east Portland zip codes, 97216, 97230 ,97233, or 97236. These include neighborhoods such as Argay, Mill Park, Hazelwood, Rockwood and parts of west Gresham, names you rarely see in the tourist guides to Portland. The trust blends microfinancing and affordable housing. "We tailored it to fit the needs of investors," Haines says. "People were motivated to own real estate but didn't know how to do it other than owning a home. So, we put forth the prospect 'What about owning this building?' They said 'I only have $25, $50 at the end of the month, how can I do that?' And they also said 'We can't afford to lose our money.' So, we had to create a risk-free, low-dollar, monthly-so-it-fits-into-their-budget, investment product." They have to have a bank account to make the payments through ACH. They can pause their account but if they move out of the zip code they have to cash out. The original idea came from meeting people in an affordable housing agency. "They said, 'We want to be part of the changes in the neighborhood, we'd like to see a pizza place, a craft shop, an ATM, and we want to invest in real estate'," said Haines. When he pointed out the plaza he said their eyes lit up. Mercy Corp conducted focus groups at Leander Court apartments and the Lents Farmer Market. "It was to give them to the opportunity to invest, where they would otherwise get gentrified out." Haines refers to this part of town as 'the Numbers', meaning avenues numbered in the triple digits. These are places it would seem hard to gentrify. Getting a food cart and an ATM seems to be more about basic services than appealing to yuppies. The plaza had been family-owned for decades. Haines says it had "gone downhill." Mercy Corps is not landlord to the tenants, which include a taxi office, two tax preparers, funeral services, a beauty salon, a food cart and some non-profits. It cost $1.2 million to buy it and was put into a corporation owned by the investors. The buyers put an additional $100,000 in tenant improvements because the "mid-century modern" style that Haines finds attractive needed some updates. It was only 50 percent leased when they bought it. Norris & Stevens manages the property now. "They're good everywhere, they are all over town," Haines says of them. "They love this neighborhood. So do we." He clarifies that this is not a Real Estate Investment Trust. A REIT is a tax designation. The REIT is not taxed, but the individuals are on distribution. "We mimicked a REIT on the structure, but can't designate yourself a REIT till you have 100 investors and we're not there. And the cost of some of REIT compliance is not worth it on this scale." "We mimicked REIT and B-Corp principles, but it's rebranded a CIT. We came up with the term." The trust runs on the operating success of the plaza. Rents are modest, as little as $250 a month for a small office with no storefront. A 1,000 square-foot space is $16,000 per year or $1,333 a month. 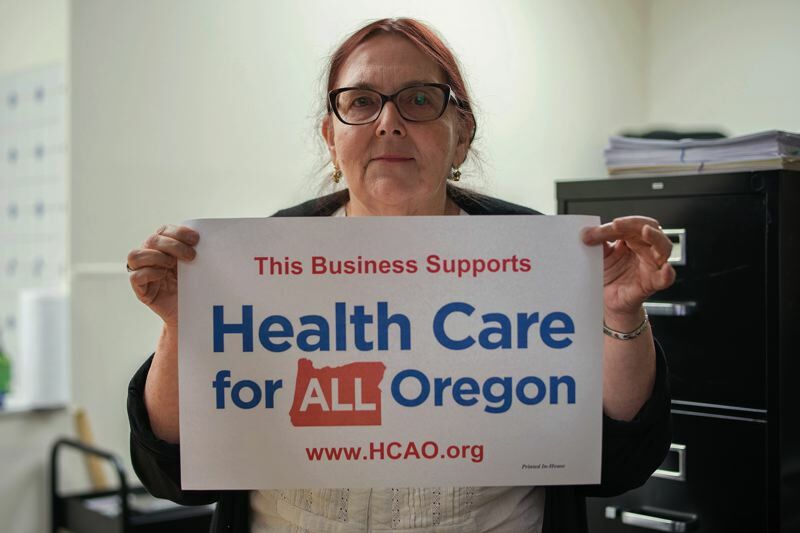 Linda Alband runs Healthcare For All Oregon, a nonprofit working on a ballot measure for 2020 to bring a single payer healthcare system to Oregon. They pay $425 a month for 400 square feet, utilities included except for wi-fi. The group is gearing up to collect signatures in 2019. It's a barebones space usually occupied by two, sometimes by half a dozen when they have a mailing party. "We used to be in the United Way building (near the Central Library downtown) but that was difficult for our volunteers, most of them are on the east side," says Alband. "We needed free parking and a way to move stuff in an out." She found Plaza 122 though her realtor and moved in in January 2016. The possibility of owning a slice of the mall was a happy coincidence, as was the African connection. She had managed a nonprofit in Kenya. Alband is not an investor but she is encouraging her adopted daughter, who is Somali Bantu, to become one, along with the daughter's partner and sister. "They want to buy a house at some point, and it'll be really good when they look to stabilizing their lives. I don't know they're going to invest in the shopping mall. Right now, they're just trying to deal with school." She explains that getting on the ownership ladder is hard work for some people. "Not everyone can have a savings account, and it doesn't help with credit rating or credibility." She includes attending the class as part of the investment — the investment of time. "I managed a program in Africa, and people in the developing world, they don't value what they don't have some sweat equity in. It's an investment." Investors can put in as little as $5 a month and as much as $100 a month. With a 9 percent dividend and no risk, it had to be capped to deter higher net worth investors taking advantage. "$100 a month disperses ownership to between 300 and 500 families," says Haines. He hopes to survey investors to see if they are any more likely to use the mall now that they have a financial stake in it. "We want to test the performance of the building. Another thing if you own a piece of a building, do you vote, do you go to public meetings, do you engage more deeply with your neighborhood?" Investors wanted to grasp what they would be getting by owning shares in a building. "A woman in a focus group said 'If I put in $10 a month for four years, that's $480. What then do I own of that building?' We have $450,000 in equity, so she owns 0.00-something percent. But I calculated after five years she would own 31 square feet, which is the size of the conference table." So, he pointed at the table and told her, "After five years you are going to own that." The mall is on 1.43 acres of land. Haines suggests some of it could be sold or developed as part of a Phase 2. "There's an urban growth boundary which inevitably creates opportunities in the interior part of town, and those opportunities are appearing in the Numbers," he says. There is more parking right now than is needed. One plan they have talked about for a long time is to cut down the water and sewer bill by tearing up the central strip of the parking lot, adding planters and swales and disconnecting the downspouts. The city rewards such changes handsomely. The current bill is about $12,000 per year for water, sewer and storm water. They estimate that the bioswale could save between $2,000 and $5,000 a year. "That goes directly to the bottom line in dividends to the local investors." The Somali American Council of Oregon has a space, and companions with PDX Yellow Cab a Somali-owned taxi company. On our tour on a weekday afternoon, the door to the Somali Association door was locked, and the owners of the wellness clinic and funeral services store did not want to talk to the media. One person with who was all smiles was Elizabeth Guerrero, who runs a healthy Mexican food cart called La Osita (Little Bear, named after one of her daughters). She pays $600 a month for the spot in south side the parking lot. Other food cart owners she knows pay $1,300 to $1,500 a month, although they have electricity and running water. La Osita collects greywater in a white tank which a service comes and pumps out every week, she cooks with propane and gets electricity from a gasoline generator. Guerrero says she is happy with the mall management and gets a lot of business from tenants and their clients, such as the beauty shop. David Douglas High School is five blocks away. Haines calls the plaza "a jewel in the rough," surrounded by private affordable housing. The real plan, according to Haines is for other cities to replicate the Mercy Corps CIT model. They have spoken at conferences in cities such as Los Angeles and New Orleans. He talks to other cities' leaders about talking to neighborhood leaders to do the education piece. "It has to be an authentic local lead." He's an investor in Plaza 122, which he heard about through participating in the East Portland Action Plan. "I approached them, to learn more and take it to my community, then I took the orientation and training and really liked it." Kassie invests the maximum, $100 a month. He cofacilitated the eight-hour course for eight of his Ethiopian neighbors who don't speak English, and seven of them decided to invest. Then he reached out to leaders in other African communities to do the same thing. "For me it's kind of impossible for a refugee and recent migrant people to own a commercial space, so it's empowering. They make the impossible possible," he told the Business Tribune. He's amazed to have even found a risk-free investment. He's also impressed that he can click to change his account any time. In Addis Ababa, the capital of Ethiopia, he ran a small pharmacy. After living in Campbell, California, in the Bay Area for eight years he moved here because his rent went from $1,300 to $2,500 a month and Portland was more affordable. He said the course teaches about risk alternatives, and, "and having an owner's mindset, what are assets, income and expenses." They also talked about personal budgeting and needs versus wants. He is convinced the CIT will help his community, which he calls "the new Portland." "The place you spend a lot of time, you have more feeling, you feel something good about that community." 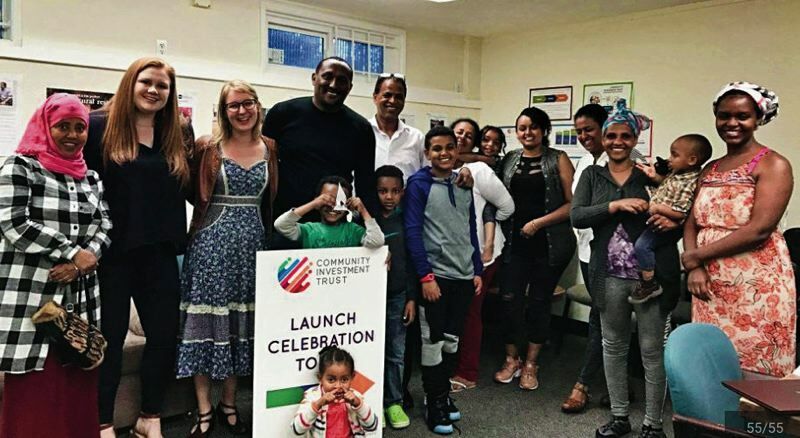 The Community Investment Trust is a first-of-its-kind financial inclusion tool created to empower residents and strengthen communities. The CIT is designed to remove barriers to financial inclusion and provide a low-dollar investment opportunity in a commercial property to local residents. Through the CIT class "Moving from Owing to Owning," investors LEARN how to create budgets, set financial goals and understand investment basics. They can then subscribe to INVEST $10, $25, $50, or $100 a month to buy shares in the CIT. Investors PROFIT in three ways. An annual dividend is paid from the profits of the building — tenants pay rent and expenses are paid. The shares change value as the value of the property appreciates and the loan on the property is paid down. Ready to take the first step and sign up for "Moving from Owing to Owning" class?